Most countries allow you to enter without a visa, some make you pay for a visa on arrival (which isn’t really a visa but a type of arrival tax) and others charge you £50 or so for a proper visa, which means sending off your passport and documentation to the relevant embassy and waiting about a week until it is couriered back to you. I have been through this procedure many times, but never had so much hassle as I have experienced recently in obtaining a visa to visit Russia. I have booked on a boat trip run by New Zealand based Heritage Expeditions to far eastern Siberia in May/June. It should be an excellent trip visiting Kamchatka, the Commander and Kurile Islands and Sakhalin but getting the visa has been far from easy. Once I had the necessary documentation from New Zealand I tried to download the application form from the relevant website, but however hard I tried I couldn’t access the site. Eventually I got a visa and travel company to obtain an application form for me. It took most of one day to gather all the information needed and then once I had all the documentation together I had to go to London to the Russian visa application centre to be fingerprinted. However once there the process was quite quick and (as I paid for the express service) I had my passport back with 48 hours. The whole thing cost about £200, an unexpected cost, but there again if the tour price had been £200 more I’d still have booked! Margaret came with me and we caught (and almost missed) the 0530 bus to Victoria. We were finished with the visa business by 1000 and opted to spend the rest of the day sightseeing the Tower of London, a UNESCO World Heritage Site, something that Margaret hasn’t done before and that I haven’t done since 1972! For 33 years of my working life I drove (and sometimes cycled) the three and a half hassle free miles to work. 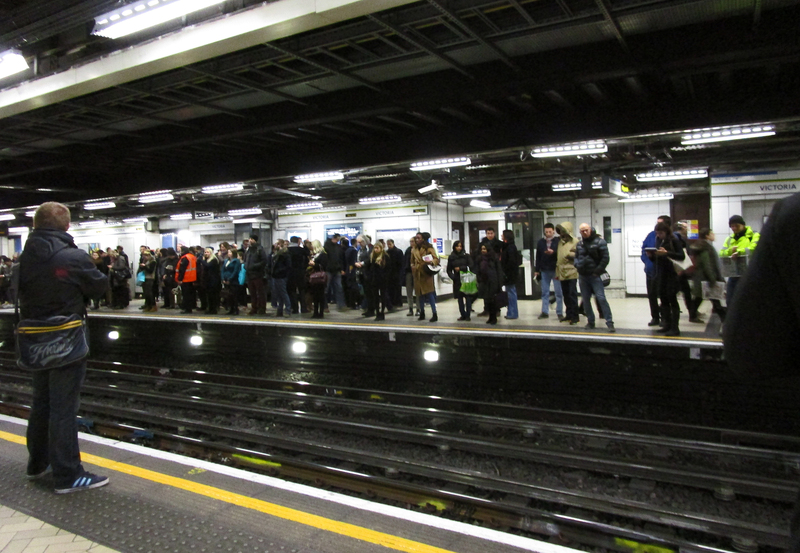 Every time I visit London I am shocked by mass of people crowded into the tube, rail and bus network, all rushing to get to work on time. Every time we go we say ‘what a great place to visit but what a dreadful place to live’. I’m sure there are many of you out there who would fundamentally disagree with that statement, but Dorset, at least away from peak holiday season, is a much more relaxed place to live. 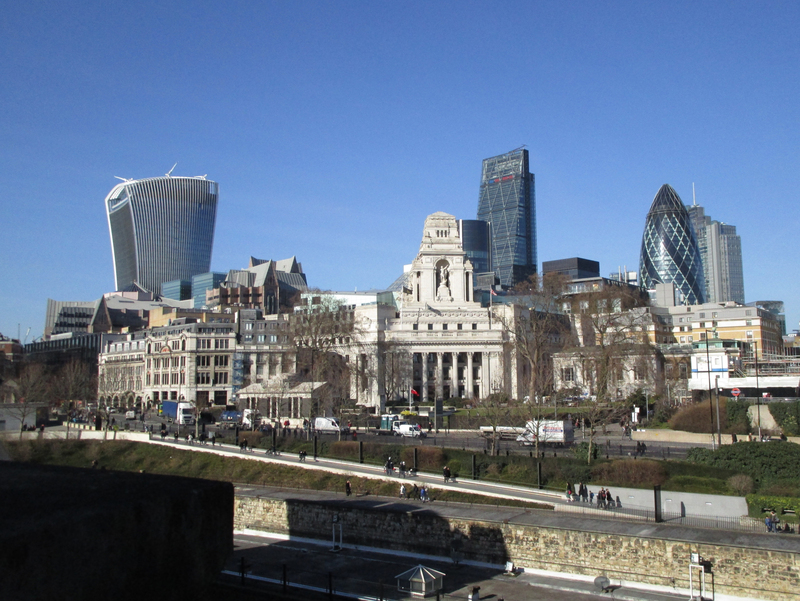 Sandwiched between the modern skyline of Tower Hill, …. …. 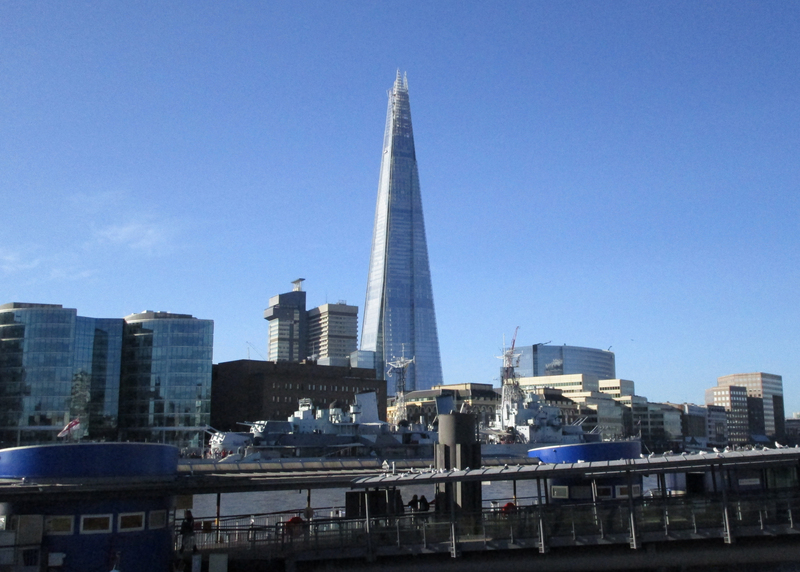 the Thames with the Shard rising in the background …. …. 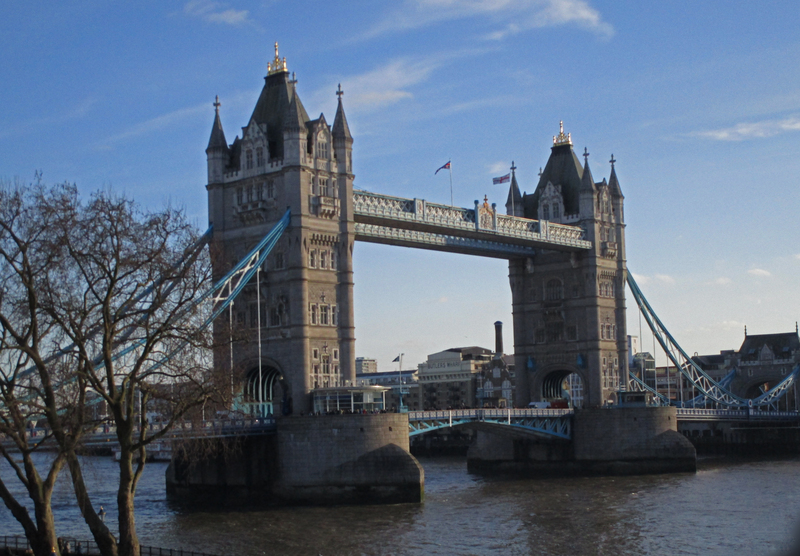 and the imposing Tower Bridge lies the ancient Tower of London. 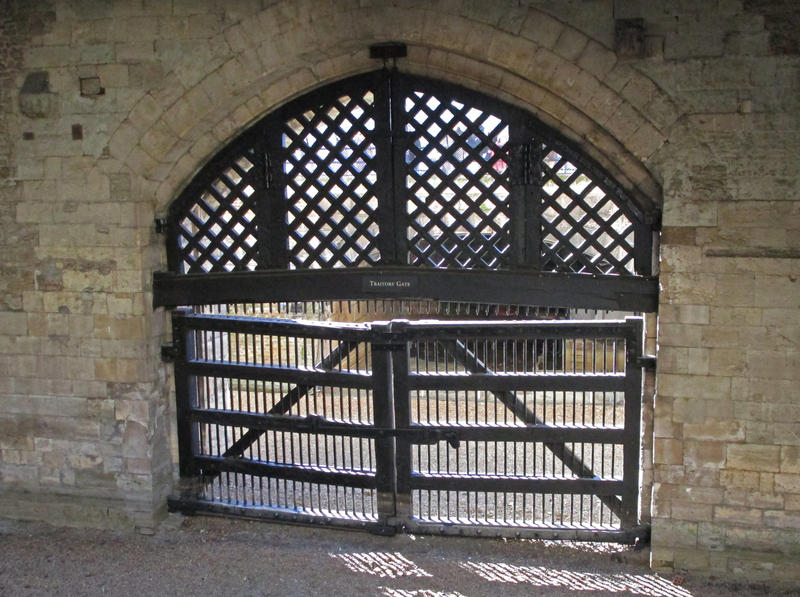 Once inside the Tower of London, the first sight you come across is the so-called ‘Traitor’s Gate’, so named as it through here that prisoners were brought from a boat on the Thames for confinement in the Tower, although its official title is the Water Gate. 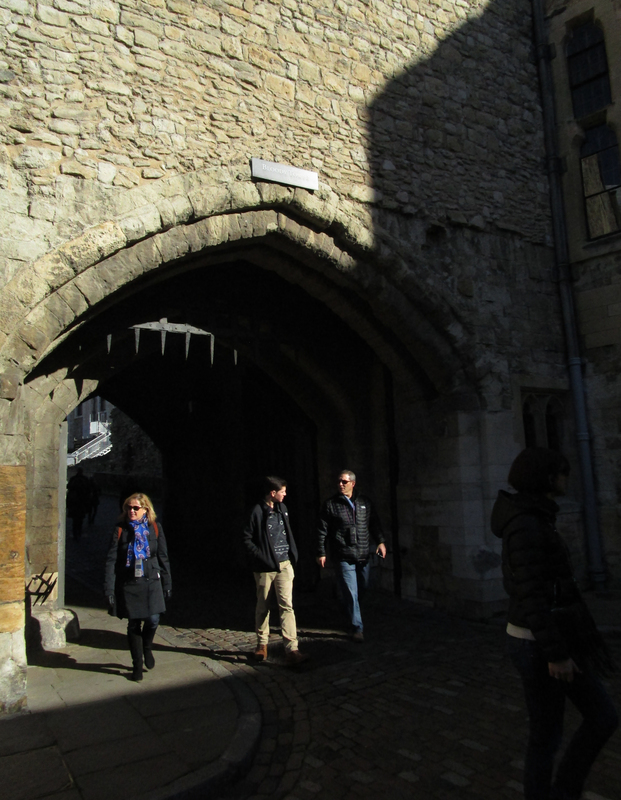 From here, led by a Beefeater, we walked though the Bloody Gate …. …. into the central courtyard. …. dominated by the White Tower. 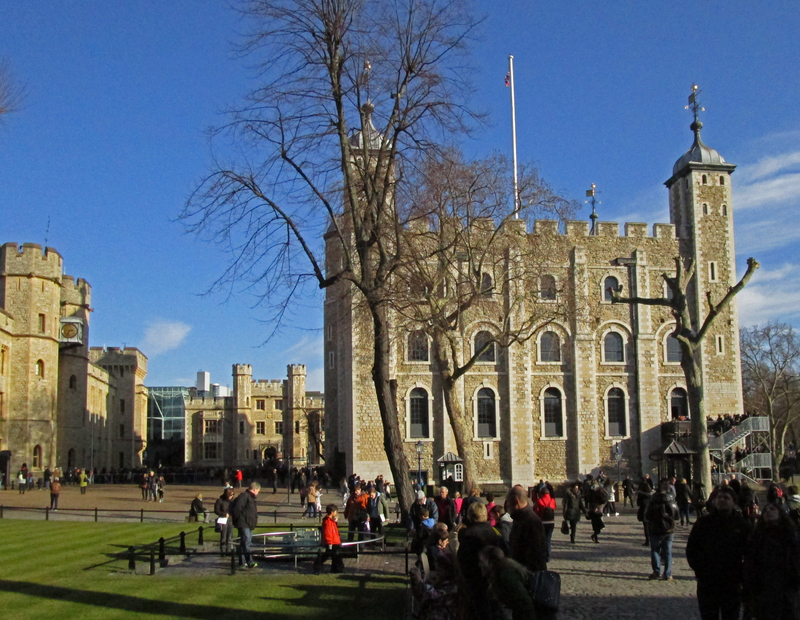 The Tower of London was first built by William the Conqueror in 1066, the White Tower dates from 1078. 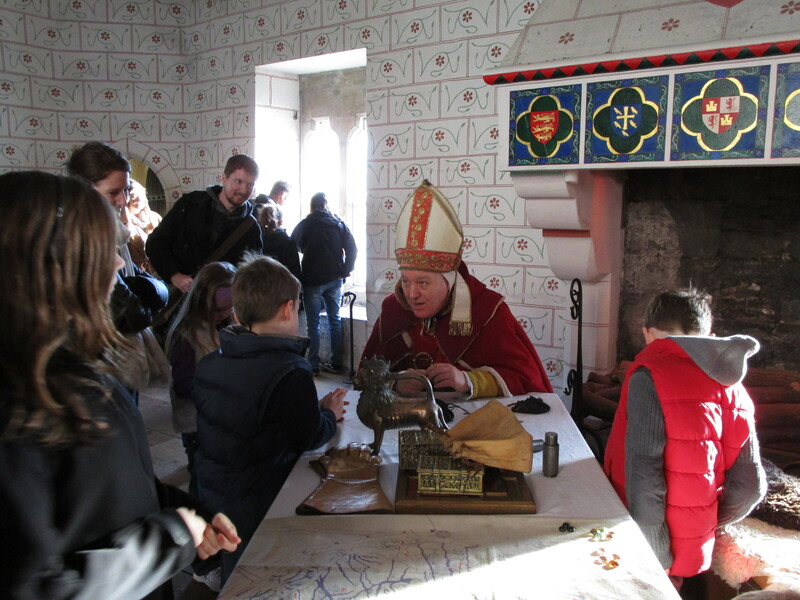 The Tower was originally built for defense and to dominate the Saxon population following the Norman invasion. It has been fortified as recently as WW II. 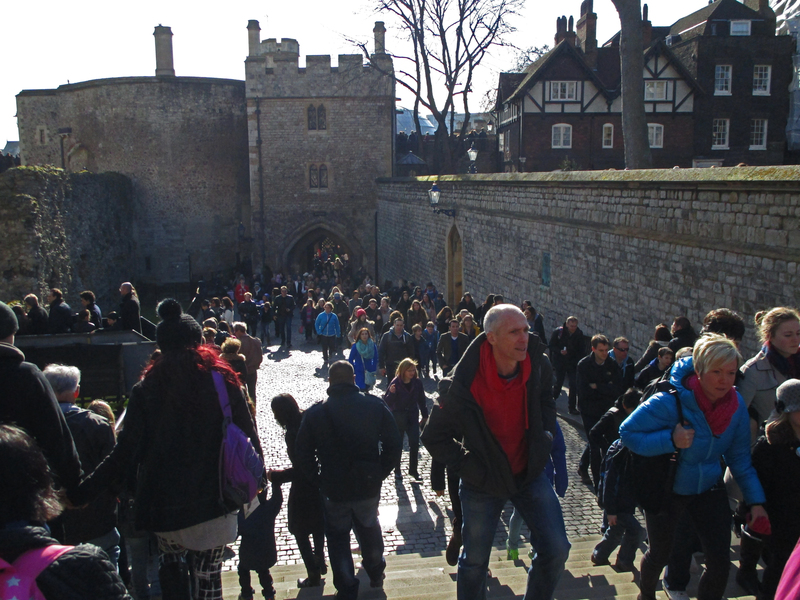 Being a nice and sunny, if cold day in the middle of the half term break, the place was packed with tourists. 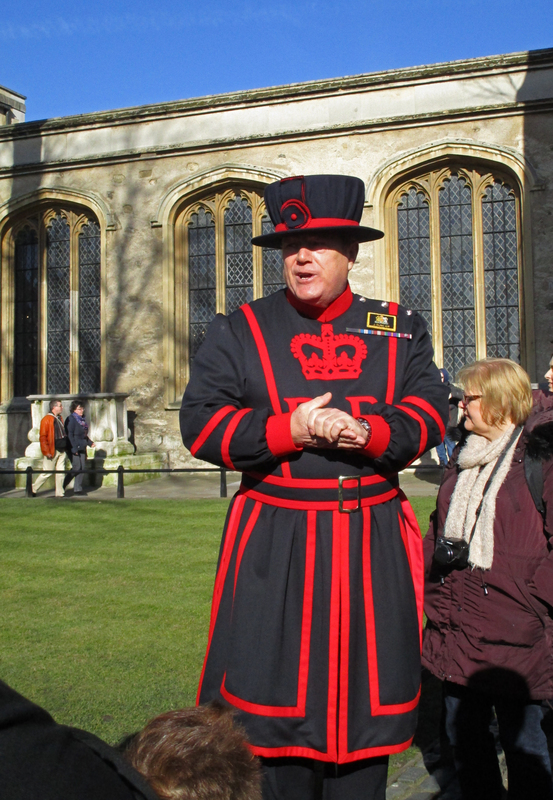 Tours given by the Yeoman Warders, known for unknown reasons a ‘Beefeaters’ can be highly entertaining. Of course he concentrated on the more grisly details such as the disappearance of the Princes in the Tower in 1483, supposedly murdered on the command of their uncle Richard III or the various executions that have occurred in or near the Tower. On or near this spot, three Queens of England, Anne Boleyn, Catherine Howard and Lady Jane Grey plus four others were beheaded. 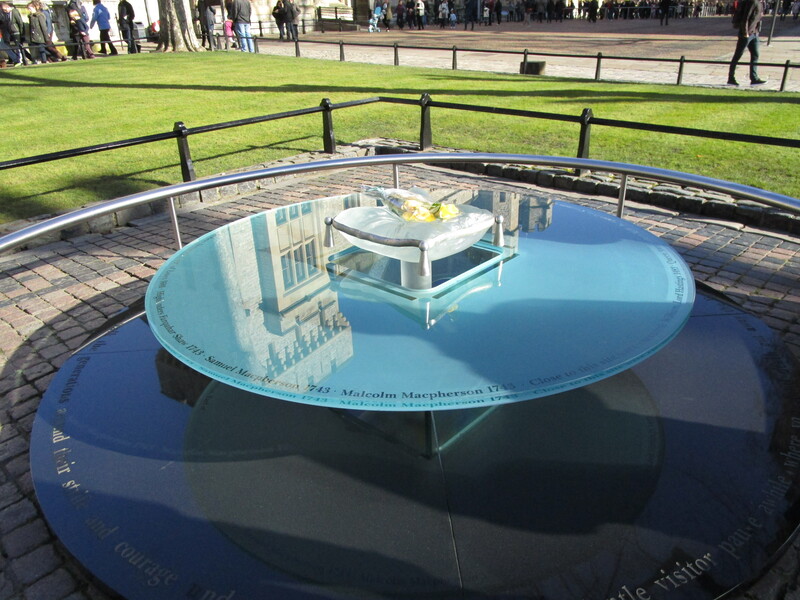 Only those close to the monarch were executed here, most ended their days at nearby Tower Hill where 112 people were executed prior to the 20th century. During both World Wars a number of spies faced a firing squad in the Tower. To the right the White Tower, at the back the HQ of the Royal Regiment of Fusiliers and to the left the Waterloo Barracks, now the home of the Crown Jewels. Sentries on guard outside the Waterloo Barracks. Photography is not allowed inside the so the next two photos are taken from the internet. We joined a very long line to see the jewels, such is the press of tourists that to see the Crown Jewels you have to stand on a conveyor that takes you slowly past the display cabinets. 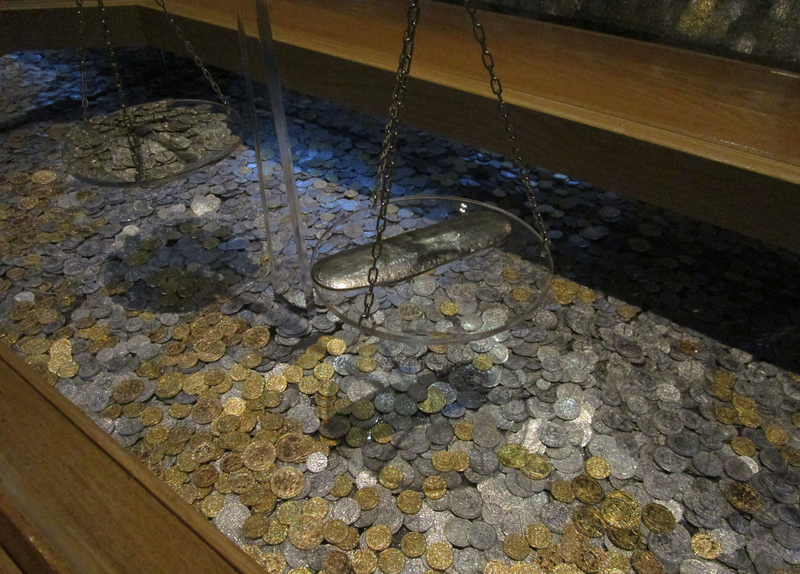 The quantity of precious stones and gold items is just staggering. 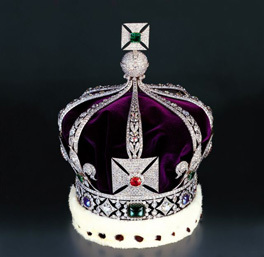 The Crown Jewels have resided in the Tower since the time of Henry III (1216 – 1272) however the original Crown Jewels were melted down in 1649 during the English Civil War and were recreated in 1660 when the monarchy was restored. 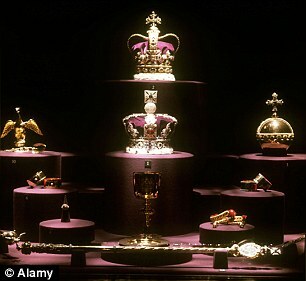 Crown Jewels in their display cabinet. 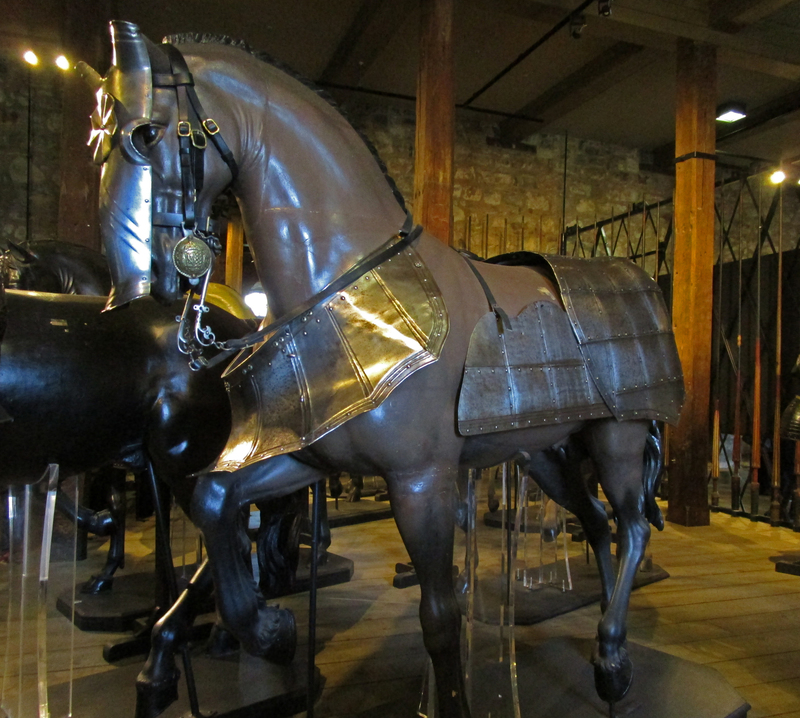 The Tower of London was once a royal menagerie. 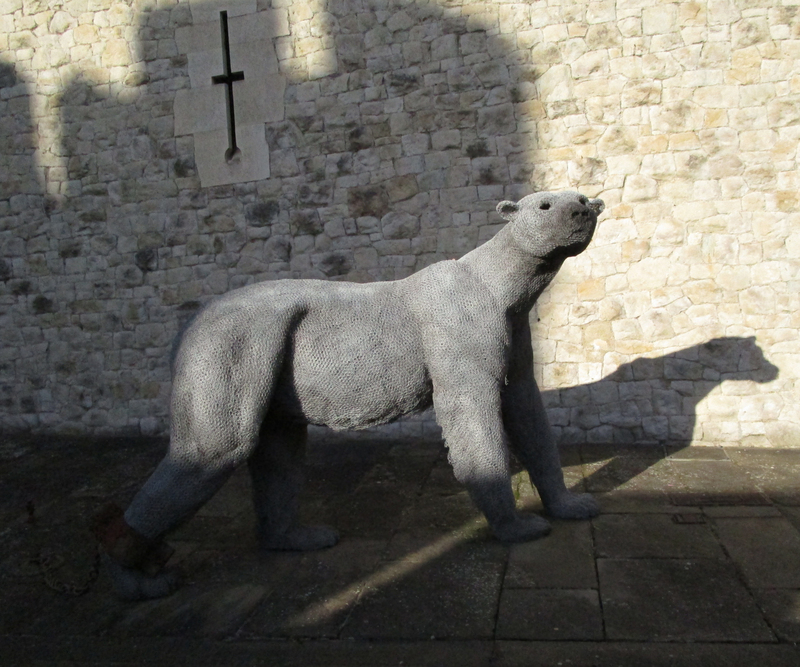 Henry VIII was given a Polar Bear by the King of Norway, this is now represented by a Polar Bear model made of wire. 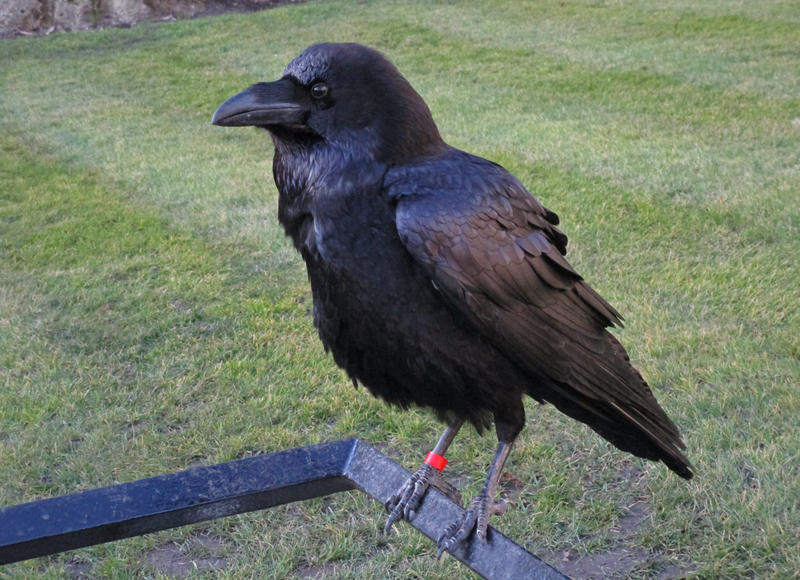 Of course there is the story that is the Ravens ever desert the Tower of London then the monarchy will fall. Just in case the birds are all pinioned! 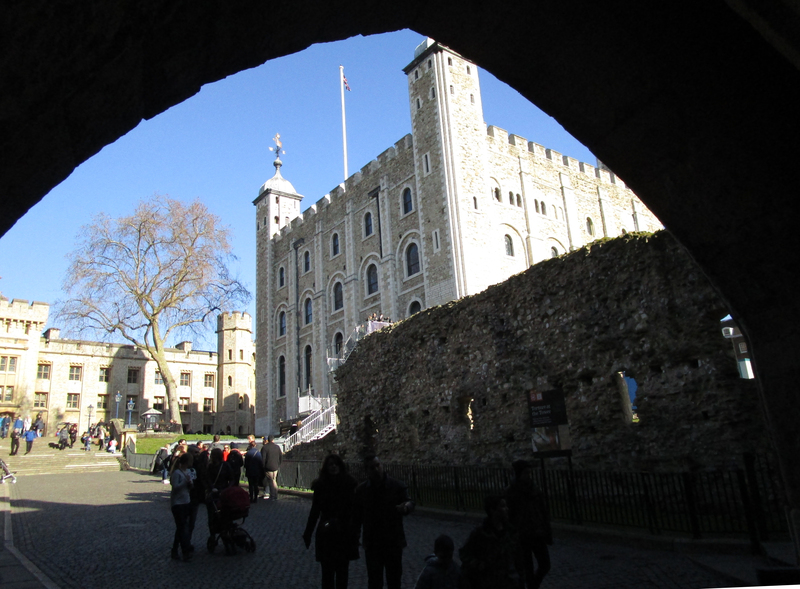 Perhaps the most famous use of the Tower of London was that of a prison. Many captives were held in Beauchamp Tower and many of the prisoners carved inscriptions on the walls. 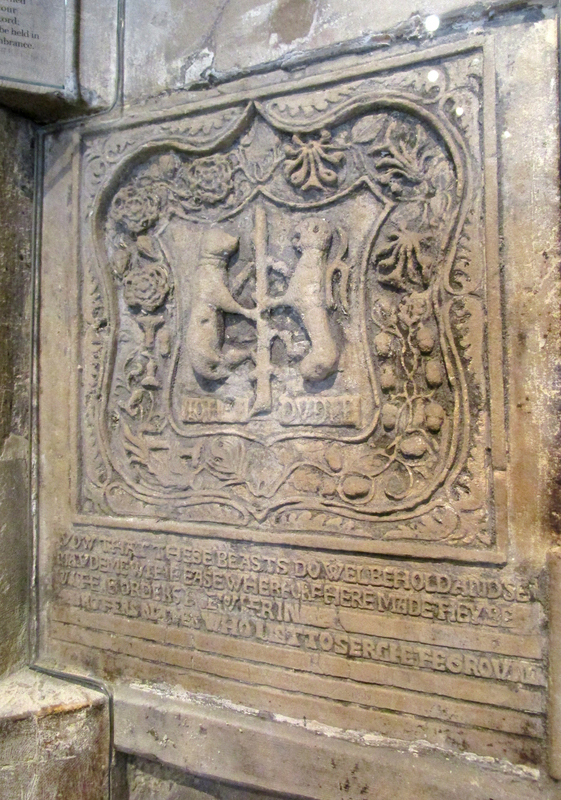 Some of the graffiti consists of just the prisoner’s names but others are extremely elaborate, for example that of John Dudley, 1st Duke of Northumberland, executed in 1553 for his part in the attempt to place Lady Jane Grey on the throne following the death of Edward III. The Tower has been used as a prison as recently as WWII when Nazi Rudolph Hess was confined here. The Tower was also the Royal Mint from 1279 to 1809 when the Mint was moved to an adjacent site in East Smithfield. Ahead of planned decimalisation, it was moved to larger premises in Llantrisant in South Wales in 1968. As well as being a prison, a mint, a royal residence, barracks and a menagerie, the Tower has also been the home of the Office of Ordnance and Armoury. 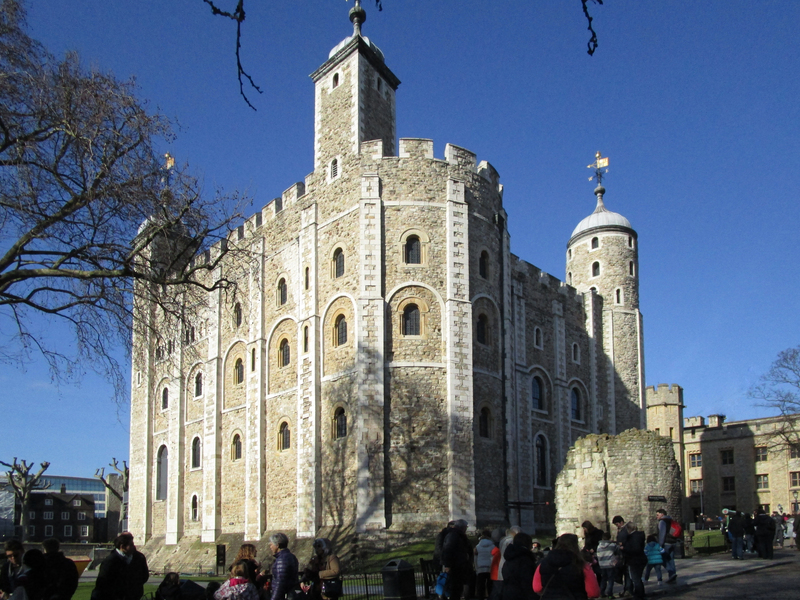 Within the White Tower is a collection of armour and weaponry some of which has been on display for centuries, making it the Britain’s oldest tourist attraction …. …. 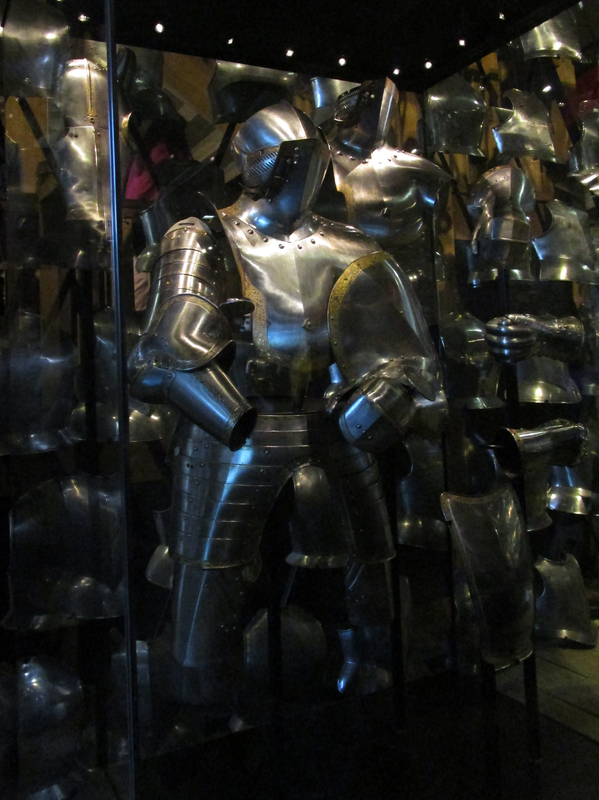 many of the suits of armour were worn by royalty. This suit was made for Henry VIII, but some are clearly fanciful, one suit said for centuries to belong to William the Conqueror has now been identified to be of a style that wasn’t introduced until hundreds of years later. 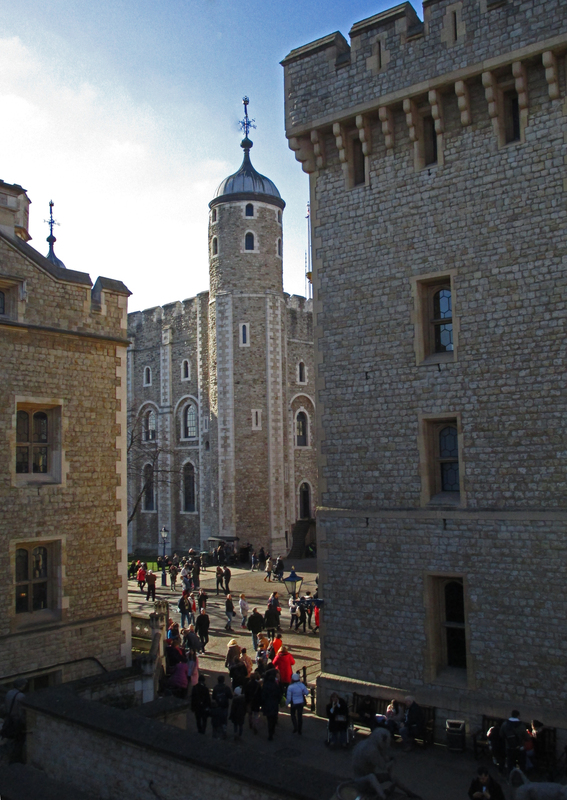 The Medieval Tower adjacent to the Thames are one of the oldest parts of the Tower and have been recently restored. 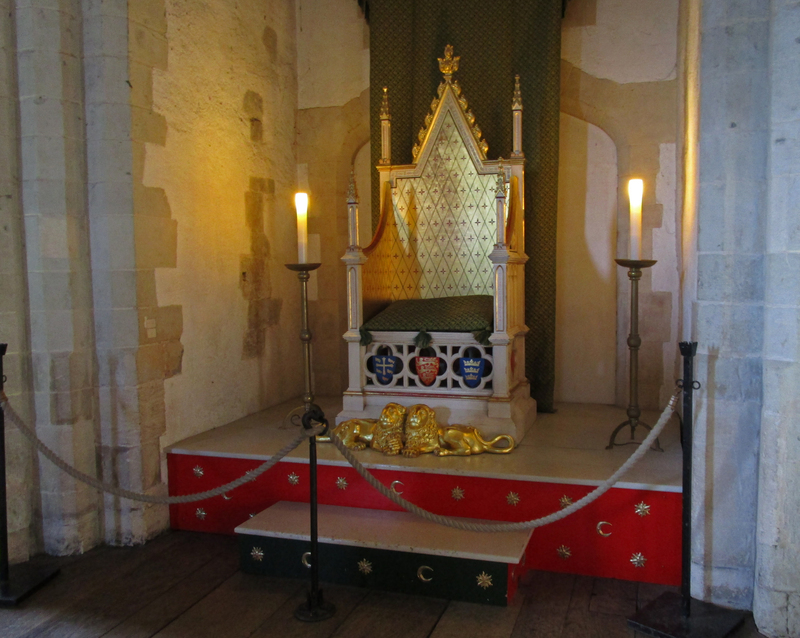 Many of the artifacts date back to the time of the Plantagenets. Re-enacting history for the kids. After a final look round the World Heritage site we had to leave …. 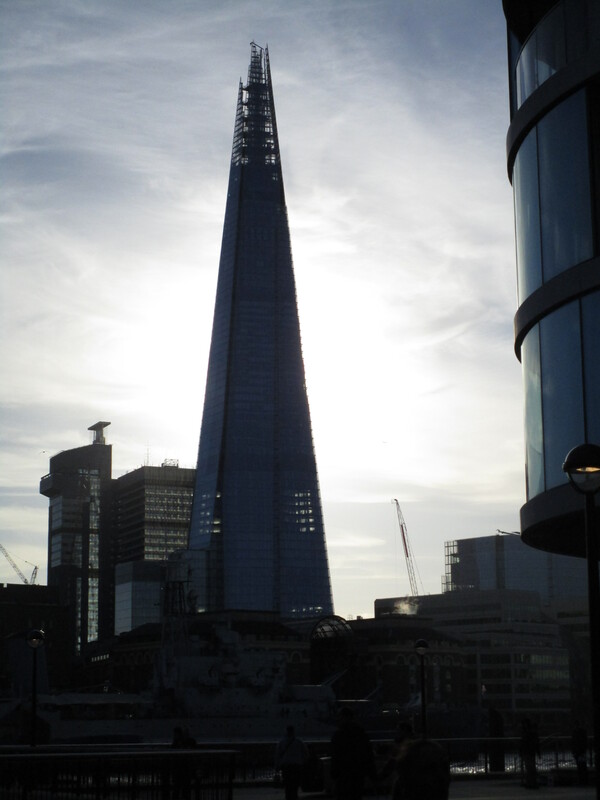 ….and as the sun set behind the Shard, catch the Tube to Victoria and get the bus back to Dorset. What I expected to be a day spent hanging around getting the Russian visa sorted, turned out to be a great day out with a fantastic insight into England’s complex history.